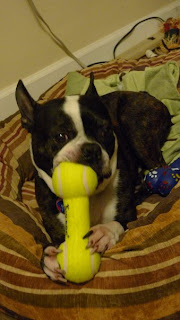 "This Sunday I was blessed to pick up my new Deaf Boston named Spikey. 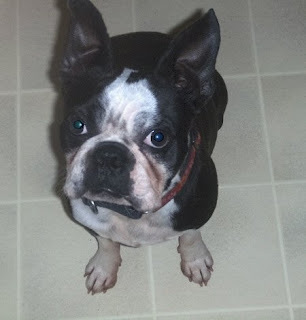 His foster mama drove up from NJ and I drove down from the Buffalo area. I'm in love already. He's such a cuddle bug and has already learned some new signs. I think I'm in heaven:)"
"We got Lilly from NEBTR about 7 months ago. 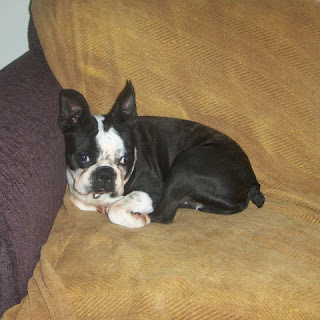 She was rescued from a puppy mill, was terrified of everything, and had no social skills. Her foster parents did a great job of introducing her to other dogs and people who wouldn't hurt her, and then they entrusted her to us. She's learned to play with our Pug Nino, and while she still doesn't like to be touched by people, she doesn't act scared any more. Thank you NEBTR for your wonderful work!" PS Click on the "Lilly" tag to read the whole wonderful story, from Lilly's earliest days, to her loving foster care by Tammy, and then her new life as part of an amazing forever home with Keith!